What do you get when you combine a powerful ERP system with a full blown MES solution? 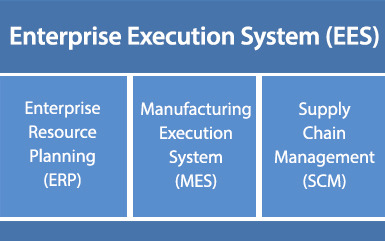 The answer is an Enterprise Execution System (EES). Embracing Changes in Manufacturing Technology. Don't Get Left Behind! It has been said, the more things change, the more they stay the same. But let’s get real. Over the years, there have been some huge changes in technology that have dramatically affected the way we do business, and for the better. Train Now or Later? What is the Best Time for ERP Software Training? I have heard many theories over the years about what is the best timing for training of employees on a new manufacturing ERP software system. Most companies like to receive a good amount of training up front. However, occasionally, a company will have employees figure out as much as they can on their own before seeking help. Both methods have pros and cons. In the long run, after observing hundreds of implementations, experience has shown me that the best solution falls somewhere in the middle. Electronic Data Interchange (EDI) is a very powerful tool for use in business and can greatly streamline communication between entities when implemented properly. The successful use of EDI, however, is not guaranteed by a successful implementation, but through the ongoing learning and understanding of the business processes being handled. Below are some areas to consider when working with EDI.